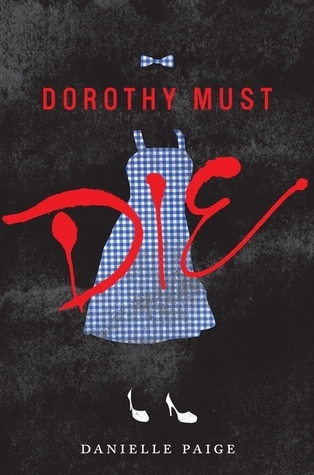 Dorothy Must Die by Danielle Paige is a great reimagining of a skewed Oz, with interesting characters, awesome and imaginative use of magic, lots of humor and gore, and genuine emotion. Just one tiny problem, okay it was a massive problem for me, the execution of the story was poorly done. Let’s back up a minute, Dorothy Must Die starts out interesting enough. Amy Gumm is a typical trailer trash girl, picked on her entire life. “Salvation Amy” has a drunk for a mother and father who left her when she about 9. I love how Amy uses sarcasm to survived and then “Kansas, tornado, blah, blah, blah.” You get the point. Amy becomes an outlander in Oz because there can only be one special girl from Kansas and that’s Dorothy. Although this ain’t Oz and Dorothy from the movie or book. “Oz – where all of your worst nightmares can come true” and “Dorothy, a psychotic Midwesterner with a reservoir of magic who was never alone, surrounded by loyal killers that would disfigure one of their own without a second thought.” Amy repeatedly states and I am paraphrasing here, I can’t believe that I’m in Oz, this is nothing like the movie that I remember as a child. By chapter six, I wanted to slap her if she said it one more time. Although, others who have read this said that they didn’t pick up on that as much as I did. The premise of the story is excellent but it really lacked execution. There were more than a few times while I was reading where I would think “if you changed this, that sentence would be so much stronger. . .” BUT, I really liked her vision and her take on the twisted Oz! The writing in this book was so choppy. I would perk up because I read an interesting couple of pages and then I would go back to forcing myself to read this. I really wanted to love it but in the end just found it okay. This entry was posted in Fantasy, Magic, Young Adult and tagged Danielle Paige, Dorothy Must Die, Fangirl, Oz, Wizard of Oz, Young Adult. Bookmark the permalink.